This post is targeted to folks that are starting their wine making experience, but there may be some tidbits for the experienced vintner. So where do we start? Enjoying wine, more often than not, is enhanced by or enhances our snacks and meals. It makes sense since they’re both tickling our taste buds and nudging our noses. So a good way to decide what kind of wine to try is to look at what we like to eat. Let’s look at Asian food, baked ham or chicken. The crispiness of chicken, saltiness of ham or spiciness of Asian dishes pair well with the soft fruity flavour of a medium white like Gewürztraminer or Muscat. Perhaps you’re thinking of having pasta with a cream sauce or turkey or Atlantic lobster. These all match well with a rich white buttery-flavoured Chardonnay. If you’re in the mood for a snack of almonds, aged cheese and fresh fruit? The extra rich and sweetness of a white dessert wine is an excellent choice. Sweet desserts, semi sweet chocolate, pecan pie or brownies are a great companion to an intense red dessert wine. Heavier meats like steak, lamb or a hearty stew work well with complex rich red wines like Cabernet Sauvignon, Cabernet Shiraz or Amarone. Planning a pork tenderloin, burgers or a spicy chili? Try something a little smoother, a more medium red like Merlot, Shiraz or Malbec. 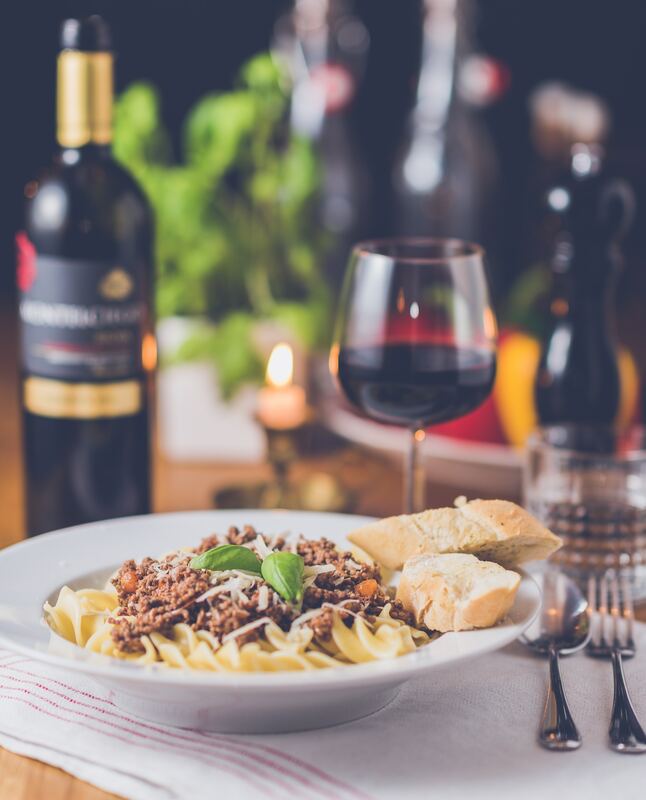 If your pasta comes with a meat sauce or you’re planning a roast chicken or pizza, a more fruity and lighter red wine is what you’ll want. How about a Pinot Noir, Sangiovese or Valpola? Having a light meal like a salad with a vinaigrette or perhaps grilled shrimp or salmon? You won’t go wrong with a light crisp white like Sauvignon Blanc, Pinot Grigio or Riesling. These are just some suggestions to help narrow down your choices, but I’ll caution you that not everyone will agree with these. Drinking wine is a different experience for every person but if you’re looking for a starting point, this may help. I’m hoping this has been somewhat useful to you. Here’s a chart that may help you if my menu selections were not ones that you could relate to.